Is this collar really that old? I am not sure. 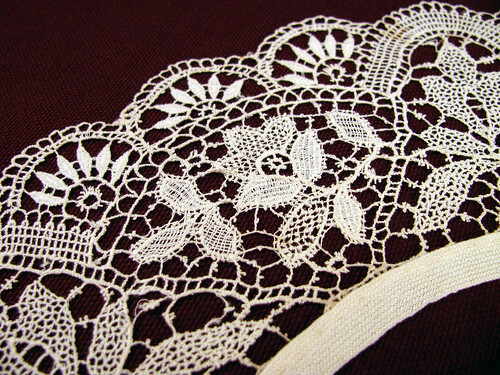 I just needed a name for it and on one site I visited a photo of bobbin lace made during the 1870’s had a very similar appearance. I never paid much attention to this piece of lace before. It is very delicate, and very fragile. 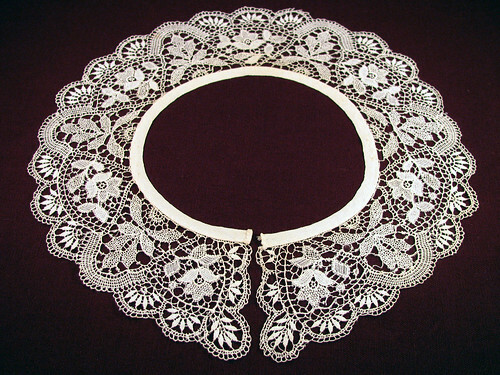 When held in the hands it collapses to nothing but ruffles, so it is very hard to see the pretty design unless it is patted out on to a dark colored cloth. Laid flat it clearly shows that it was made to be a collar, and not cut and sewn into shape. I would like to soak some of the spots out. The only way to safely do that is to carefully baste it to another cloth. Then lay it flat, agitating the water carefully over it. Still I would hate to see it disintegrate. The close-up photo shows its delicate construction. This entry was posted on Thursday, March 19th, 2009 at 3:00 am and is filed under Lace and Vintage. Tagged: Lace, Vintage. You can feed this entry. You can leave a response, or trackback from your own site. Oh all that lace is soooooo pretty! Great closeup photos showing terrific detail. Nice blog!